The National Theatre Okinawa was opened in Urasoe City, Okinawa in January 2004 with the purposes of serving as the point of exchange for promoting tradition and culture in the Asia-Pacific region by utilizing the topographical and historical features of Okinawa, while at the same time striving for the preservation and promotion of Okinawa's traditional performing arts, including a nationally important intangible cultural asset, "Kumiodori". The task of the National Theatre Okinawa begins with scheduled performances of Kumiodori, Ryukyuan dance and Ryukyuan music. Regular performances and promotional performances are considered independent performances, providing an opportunity where Okinawa's traditional performing arts can be widely appreciated by the general public. Performances from mainland Japan and the Asia-Pacific region, both regions that influenced Okinawa's traditional performing arts, will also be held as project performances. Next comes the task of nurturing successors as performers and musicians for "Kumiodori". "Kumiodori" lacks in the absolute number of performers, and the training of successors is urgently required. The National Theatre Okinawa has plans to advertise for trainees, organize a complete team of lecturers, and carry out a training course for Kumiodori successors under a full-scale curriculum. Next come tasks including research and study, document gathering, performance record making and future development and public showings. New and old scripts, costumes and props will be gathered and publicly shown along with other materials on Okinawan traditional performing arts. Furthermore, efforts to gather materials from mainland Japan and the Asia-Pacific region will also be made. After the aforementioned comes exchange with the Asia-Pacific region through traditional performing arts by utilizing Okinawa's topographical and historical features. For the time being, exchanges will be attempted through public performances of performing arts from the Asia-Pacific region, but in the long term symposiums will be held and human exchanges, such as receiving trainees, will be promoted. In cases where independent performances are not held, the theatre will be leased to the general public in order to widely contribute to the promotion and development of culture. 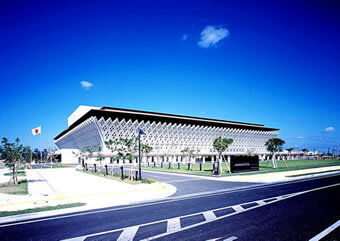 As with the other national theatres, the National Theatre Okinawa belongs to the Japan Arts Council. The council entrusts the administration and operation of the theatre to the National Theatre Okinawa Management Foundation. Since the National Theatre Okinawa Management Foundation aims for a theatre operation making the best use of the uniqueness of Okinawa's traditional performing arts and culture, it was founded upon the support from local concerned parties.